Bouquet Canyon Creek is located approx. 30 miles north of Los Angeles, near the city of Santa Clarita. From I-5 exit Valencia Blvd. Travel East to Bouquet Canyon Rd. Travel N. on Bouquet Canyon Rd. to the creek and on up to the reservior. Be sure to have a Wilderness Permit displayed in your windshield if you plan to park your car here. Daily permits are available for $5 at the ranger office. As long as there is enough water flow to support them, rainbow trout are stocked here by the DFG from late Spring through Summer. The plants start from Bouquet Reservoir downstream approx. 9 miles to Texas Canyon. Be sure to visit the CDFW web site for complete regulations before heading out. This is a very small creek with some portions as narrow as 3 feet across at times. For this reason, easy limits are common, but it also gets fished-out quickly. The best time to go is within 3-4 days after a DFG plant. Also, because of it's size, lures and artificials are very difficult to fish here. The best outfit to use is an ultra-light spinning rod baited up with live crickets, worms, or salmon eggs. 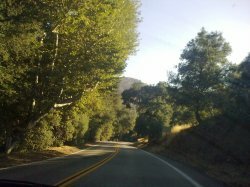 I went fishing in Bouquet Canyon Creek in September 20,2009.It was a very nice experience since i only did ocean fishing before.I caught several small rainbow trouts. Yes,small,very small and only rainbow trout :)). 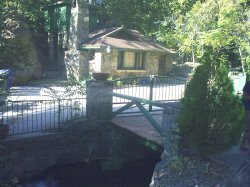 +One of my favorite spot is if you go all the way up to the hill,you will see a sign of the waterfall,past the waterfall, you'll see an old empty house on the left,do fishing in the that bridge. The green bridge next to it is another got spot.I got all my fishes right there. +Make sure that you obtain a parking permit and fishing license IF YOU DO NOT WANT TO DEAL WITH HEAVILY FINES.